Spectrum Baroque Stained glass for windows and glass projects. Baroque glass is manufactured by Spectrum glass company. In the 1970's they started by creating this, marble, swirly, reamy clear glass. "It looked like a cats eye marble. Limited to primary colors with a base of crystal clear, Spectrum baroque took off as a wild new defined "art glass". Over the years Spectrum glass changed as all forms of art change with time. Spectrum baroque colors met the needs of the lighting, kitchen, bath and other architectural building trends. 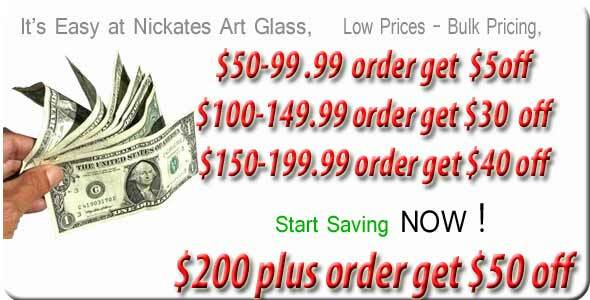 Nickates stained glass supplies inc stocks and ships hobby glass sizes 8x10 and 12x16. Larger baroque sheets 24x48 may be picked up at our warehouse only. Please call for pricing and arrangements.